Clean shares have become the embodiment of an industry discussion around investor fee transparency and fee compression. Boston, November 28, 2018 – An expansion of clean shares (or the elimination of shareholder services fees) would greatly affect the balance of economics between product distributors, manufacturers, clients, and advisors. This is complicated by an overall downward trajectory of investment product and advisory revenue. As a result, U.S. custodians and asset managers are looking at their economic value chains, and all areas of profitability are in question. 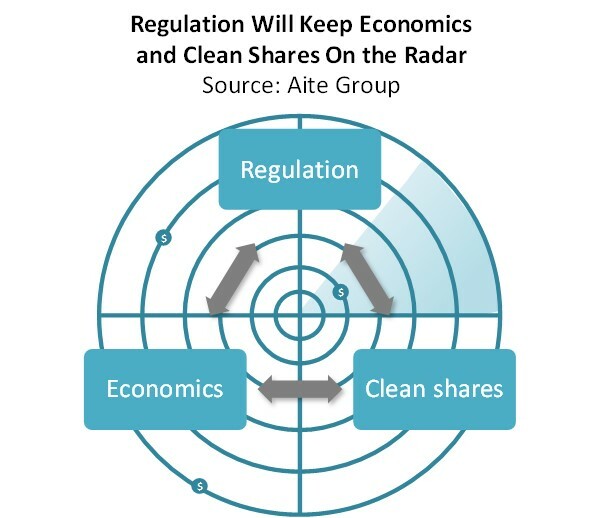 This report examines global regulation, how the clean share idea accelerated the conversation about investment product economics, and how U.S. financial providers view their alternatives. The analysis in this report leverages Aite Group interviews in the second and third quarters of 2018 with firm executives from U.S. custodians, asset managers, and industry groups. This 48-page Impact Report contains 19 figures and nine tables. Clients of Aite Group’s Wealth Management service can download this report, the corresponding charts, and the Executive Impact Deck. This report mentions AIG, Alison, LLC, American Funds, ANZ, BT Financial Group, Capital Analysts LLC, Capital Group, Charles Schwab, Citigroup, Commonwealth Bank, Credit Suisse, Deutsche Bank, Dimensional Fund Advisors (DFA), Dodge & Cox, Edward Jones, Envoy Advisory, Everhart Financial Group, Fidelity Investments, First Western Advisors, Harbour Investments, J.P. Morgan, Macquarie Bank, Manarin Investment Counsel Ltd., Morningstar, Packerland Brokerage Services, Pekin Singer Strauss Asset Management, SunTrust, TD Ameritrade, Westpac, and Vanguard. Wealth Management in the U.K.: Island of Opportunity?